Virginia Hospital Center plans to build a new outpatient building and parking garage on a 5.6-acre site on North Edison Street that it will buy from the county under terms of a 2015 land purchase agreement. WASHINGTON — The Arlington County Board voted three to two in favor of approving a yearslong plan by Virginia Hospital Center to expand its Arlington campus. Virginia Hospital Center plans to build a new outpatient building and parking garage on a 5.6-acre site on North Edison Street that it will buy from the county under the terms of a 2015 land purchase agreement. The extension will be bounded by North George Mason Drive, 19th Street North and North Edison Street. “Although the final design does not resolve all community concerns, the Board appreciated the changes realized in the design in recent weeks, consistent with our September guidance, to improve the physical building’s relationship to the surrounding neighborhoods,” said Arlington County Board Chair Katie Cristol. The board postponed a decision on the hospital’s expansion in September after hearing public testimony, asking the hospital to tweet the expansion’s design. “We are grateful to have constructively worked with community members to reach a positive solution, and we are committed to remaining good neighbors in the Arlington community,” said Virginia Hospital Center Vice President of Business Development Adrian Stanton. Board members John Vihstadt and Erik Gutshall voted no, saying the hospital could have done more to fulfill guidance the board gave in September and to make design improvements sought by nearby neighbors. 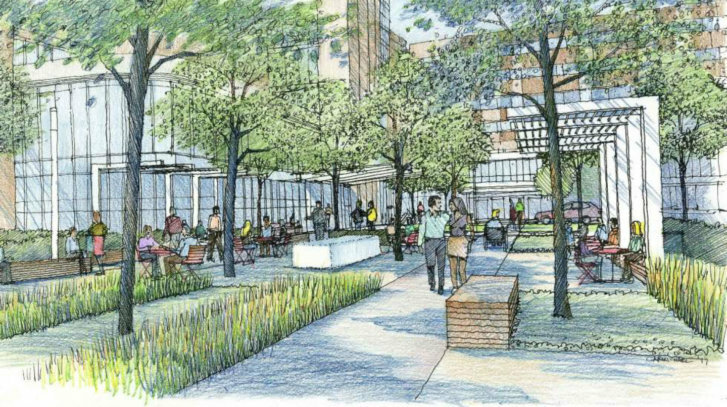 The revised design for the east-west connection through the sites relocates a sidewalk to the south side of a service drive, along the existing medical office building at 1715 N. George Mason Drive. The hospital also redesigned the north-south connection to provide a publicly accessible path from 19th Street to the interior of the campus, with a small plaza. The expansion will replace existing buildings with a new, seven-story outpatient building and a six-story parking garage. Moving outpatient uses to the new building will free up the hospital’s existing site for a planned 101-bed expansion.